Victorian tourists snapped up this continental crockery | The Dacorum Heritage Trust Ltd. 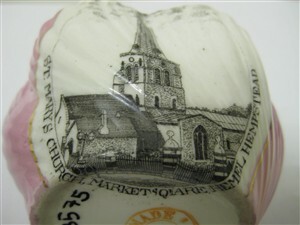 Pink lustre souvenir bowl with an image of St Mary’s Church, Market Square, Hemel Hempstead. Mass travel, however, required small cheaply-produced souvenirs and from about 1880 demand was supplied by porcelain factories in Germany and Czechoslovakia. 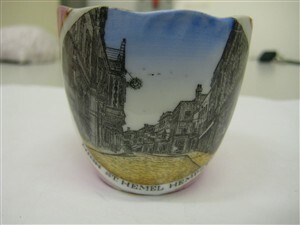 Within a few years most towns and many villages in England were included in the production. Topographical scenes were printed on cups and saucers, plates, small jugs, sugar bowls, mugs, and less commonly, candlesticks and small vases. The fabric of the porcelain was white but the area round the printed pictures was usually a lustrous pink, or less commonly green or blue. It is one such souvenir whose acquisition for Dacorum Heritage Trust was recorded in the 37th newsletter of the Friends of Dacorum Museum in September 2007.